I suspect that the first food memoir might be The Physiology of Taste: or Meditations on Transcendental Gastronomy by Jean Anthelme Brillat-Savarin (born 1755), notably translated by M.F.K. Fisher. 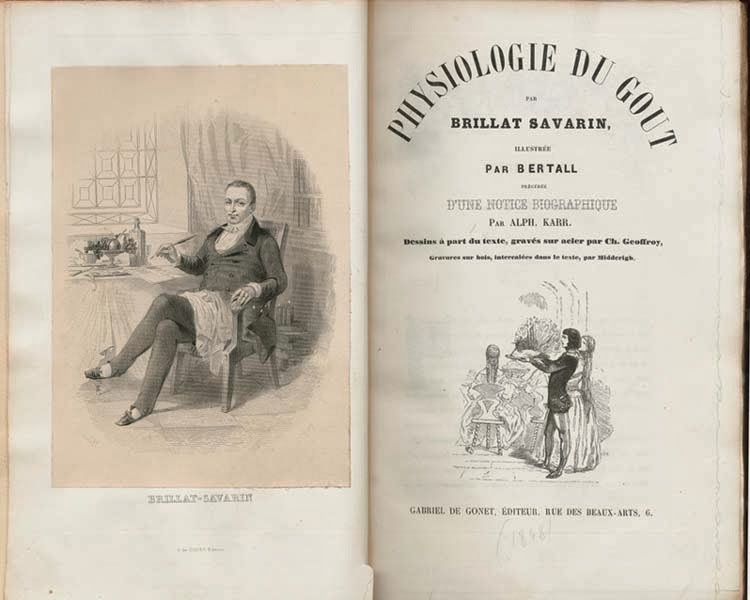 Brillat-Savarin's memoir is famous for originating the expression "you are what you eat," as well as for the aphorism "The discovery of a new dish does more for human happiness than the discovery of a new star." I have enjoyed reading food memoirs for many years, perhaps beginning with A.J.Liebling's memoir Between Meals: An Appetite for Paris and Orwell's memoir of being Down and Out in Paris and London. Early in my food reading experience, I thoroughly enjoyed Calvin Trillin's many memoirs in the New Yorker and in book form -- often also about dining in France. Also, I loved several books about about life in the wider Mediterranean region: an older memoir titled Honey from a Weed and several memoirs by Mary Taylor Simeti, an American who married a Sicilian and has lived there for years. Two books about becoming a chef especially interested me, the stories of Marcus Samuelsson and Jacques Pépin. Samuelsson was born in Ethiopia, was adopted by a Swedish family, trained in various parts of Europe, and is now an American celebrity chef (blogged here: "Yes, Chef"). Pépin was one of the last generation to experience the completely traditional chef's apprenticeship beginning at the age of 14; he also ended up in America (blogged here: "The Apprentice"). Recently, I read Mastering the Art of Soviet Cooking by Anya von Bremzen. Sort of a tour-de-force, it manages to present the history of Russia just before, during, and after Communism through a selection of typical meals that might have been served each decade of the 20th century (blogged here: Cuisine without Food). And for a completely different cultural milieu: Climbing the Mango Trees by Madhur Jaffrey describes the girlhood in India of this famous woman who has been highly successful both as an actress and a cookbook author (blogged here: "Climbing the Mango Trees"). Mastering the Art of Soviet Cooking by Anya von Bremzen -- most highly recommended. I'm simultaneously posting this on my food blog.